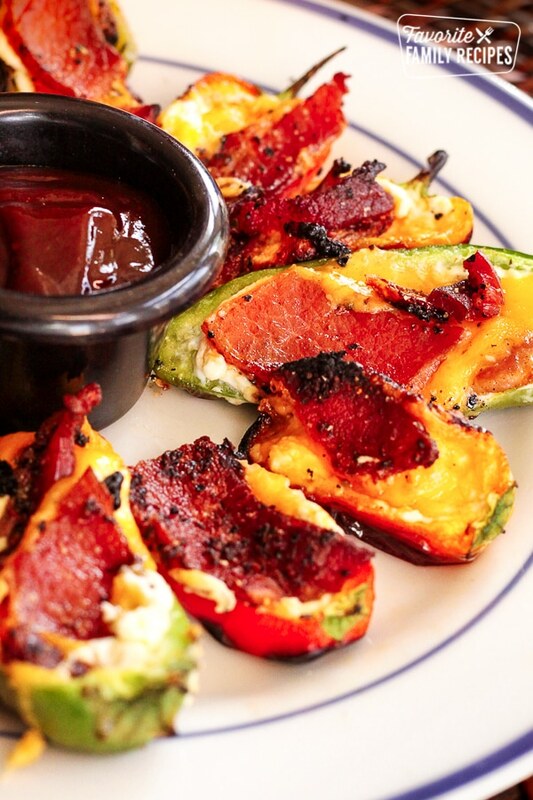 These Grilled Cheesy Bacon Jalapenos are such a great BBQ side dish. If you are worried about the spice you can also use mini bell peppers, those work great too! Previously, this Grilled Cheesy Bacon Jalapeno Poppers recipe JUST had melted cheese but we received a comment from one of our readers to add bacon and cream cheese. We tried it out and liked it MUCH better.. so here is the new and improved recipe. Thanks Chelsie! Don’t think that because these are made from jalapenos they will be crazy hot. If you remove all the seeds they should actually be pretty mild. You can also use small bell peppers if you are really worried about it. We did a combination of jalapenos and bell peppers last time and we loved the variety. These make a great side dish or appetizer to burgers! Chop stems off jalapenos, cut in half (lengthwise), then remove all seeds. They should look like little green boats. Sprinkle with garlic salt. Using a butter knife, spread some cream cheese in each jalapeno. Place a rectangle of cheese Colby Jack cheese over the cream cheese . Top with bacon and grill on low-medium heat until cheese is melted and the outside of the jalapeno is soft and cheese is melted. Remove from grill and sprinkle on some fresh cracked pepper to taste. Serve immediately with ranch dressing or BBQ sauce for dipping. I would love to serve these at a family gathering..yummm! AWWWWW YEAHHHH! These look great for a party. YUM! Would this recipe work just as well with other types of peppers as well. Possibly Anaheim peppers? try this with bratwurst mixed with cheese and you have a winner, and I have tried it with Anaheim, not quite as good. I put real bacon crumbs on these and it is amazing. Reminds me of the grilled bacon wrapped stuffed jalapenos that we got at a little roadside restaurant that served the best BBQ ive ever had.